A Saudi-led United States supported coalition continued to bomb Yemen on Dec. 17 amid the announcements of a ceasefire. Talks between the various political parties and alliances inside the country agreed on a seven-day cessation of hostilities in mid-December. Nonetheless, there has been no easing of tensions on the ground or airstrikes carried out by the Saudi Arabian and Gulf Cooperation Council (GCC) supported coalition carrying out its deadly bombardments utilizing Pentagon intelligence and re-fueling technology. Meanwhile ground forces composed of the same Saudi-led alliance has launched an offensive near the capital city of Sanaa. Ansurallah (Houthi) forces have controlled the capital of the impoverished Middle Eastern state since September 2014. The Ansurallah Movement has its origins among the Shiite population in the north of Yemen which has been waging a protracted struggle against neighboring Saudi Arabia for many years. Opponents of the Houthis say that they are backed financially, politically and militarily by the Islamic Republic of Iran and therefore seek to frame the escalating conflict as a proxy war between Riyadh and Tehran. Military units fighting under the banner of the ousted President Abedrabbo Mansour Hadi who are supported by the United States backed Saudi-led coalition were engaging Ansurallah-controlled areas in the Nihm district, Sanaa province, after claiming significant advancements in Marib province, just east of the capital. Forces loyal to Hadi, and its allies in the area, attacked Nihm’s Fardha military base, located northeast of the capital. The area between the Fardha military base and the capital, approximately 40 kilometres, is largely rugged mountainous terrain. On December 18, Saudi-allied forces seized Hazm, the capital of Jawf province, northeast of Sanaa. Later on December 19, the Hadi-allied Saudi-backed units had moved to Jawf, taking over Al-Ghayl and Al-Maton districts, said sources in the western-backed Popular Resistance militia. 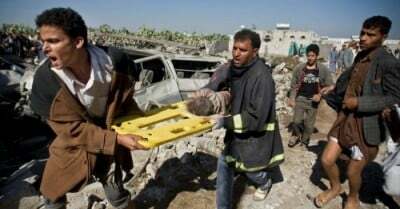 It was estimated that at least 68 people died on December 19 in clashes between pro-Saudi fighters and Ansurallah units in northern Yemen, local residents reported, prompting additional warnings by the United Nations of a total breakdown in the negotiations in Switzerland. The casualties included 28 fighters allied with Hadi and the Saudi-GCC coalition. Sources in the northern region reported that the Ansurallah units lost 40 people in heavy battles near the northwestern town of Haradh, which was attacked earlier in the week by Hadi loyalists. Approximately 50 Ansurallah and 40 Saudi-backed fighters were wounded in the clashes. Fighting intensified during the early morning hours on December 19 when Saudi-GCC allied forces sought to move towards the Red Sea port of Midi. Hadi and Saudi-allied forces trained in nearby Saudi Arabia invaded northern Yemen from the monarchy on December 17 attacking Haradh. Ansurallah forces are fighting alongside Yemeni soldiers remaining loyal to former President Ali Abdullah Saleh who left office after mass demonstrations in 2011. The escalation of conflict in Yemen since late March has resulted in the deaths of 7,500 people, the wounding and injuring of 14,000 more and the displacement of millions. Fighting has spilled over into eastern Saudi Arabia where the population is Shiite. The Saudi-GCC coalition which uses Pentagon provided warplanes, bombs and intelligence resources, is obviously escalating its attacks on several regions of the country accusing the Ansurallah (Houthis) of violations of the ceasefire. However, the Houthis-allied armed forces have no air power and are fighting on the ground against well-armed units of the Saudi-backed militias along with special forces and troops from Riyadh, United Arab Emirates, Egypt and Sudan. In addition to these foreign forces involved in the efforts to drive back the Ansurallah from the areas they have seized over the last fifteen months, the UAE has recruited and deployed troops from the U.S.-backed South American state of Colombia. This government is the third largest recipient of Washington’s direct aid falling right under the State of Israel and Egypt. This decision to contract Colombian troops was made in part as a result of the killing of 30 Emarati troops during fighting in September in the south of Yemen. The arrangement for the deployment of the Colombians was carried out by Blackwater, the so-called military services firm which has trained special forces in the UAE. Blackwater military contractors played a significant role during the initial U.S. occupation of Iraq in 2003-2004 when some of their employees were accused of committing atrocities against people in this Middle Eastern state. The humanitarian crisis inside the country has reached catastrophic proportions since the Saudi-GCC coalition has prevented food supplies, medicines and water from reaching affected areas in the conflict. Hospitals, schools and residential districts have not been spared in the bombing explaining the high rate of civilian casualties. Ports on the Yemeni coast have been bombed repeatedly since March. Yemenis have taken refuge in Djibouti in the Horn of Africa which hosts a military base of the U.S. Africa Command (AFRICOM) at Camp Lemonier. Nonetheless, it was reported that a decline in fighting on the ground in some areas provided hope for the immediate future, although many are concerned that it could erupt again soon with the same ferocity. The Saudi-GCC coalition has been bombing Yemen since late March and also providing arms and coordination for a ground war designed to force the Ansurallah and its allies out of Southern and Central Yemen. The prisoners swap was also halted in the Bayda province after local leaders blocked the transfer saying that their fighters were not included in the operations. The supply of arms to Saudi Arabia by Britain has also received criticism inside the UK by a leading newspapers as well as Amnesty International for fueling the conflict that has killed thousands. Newspapers such as the Independent and the Guardian suggest that the supply of arms from London is creating an even more deadly situation on the ground in Yemen. Talks are scheduled to continue in Switzerland. Although it remains to be seen what real impact the discussions will have considering the escalation of fighting in the central and northern regions of the country. Yemen is yet another example of the failed imperialist war policy towards numerous Middle Eastern and North African states. At present, 60 million people have been displaced both internally and externally as a direct result of the Pentagon wars throughout various geo-political regions of the world. This crisis of displacement is the largest in history even exceeding figures from the conclusion of World War II.